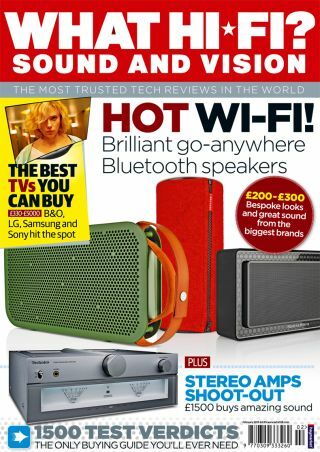 Hot wi-fi – brilliant portable speakers and more in our February 2015 issue | What Hi-Fi? Stylish. Functional. Portable. It's time to jazz up your music on the move and go wireless – we take a look at some of the best portable speakers as the latest issue of What Hi-Fi? Sound and Vision goes on sale today [14th January]. Bluetooth speakers are climbing the ranks in hi-fi society and we have seven prime examples of how diverse and exciting this area of the market is right now. From new contenders to familiar faces, there are plenty of options for you. With a price range from £200 to £300, these seven portable products are attempting to woo you with the very best in design, features and usability to warrant a place in your home. But which one will stand out from the pack? Big or small; curved or flat; HD or 4K – we won't be discriminating in this month's TV Group Test, with nine screens aiming to capture our attention. Purchasing a new set can be an absolute minefield, so we did the hard work for you. And there are sets to suit all budgets, where only the best TVs need apply. From Sony and Samsung to LG and Bang & Olufsen, here are the screens that we think are the ones to help get 2015 off to the strongest possible televisual start. Unlike their home cinema comrades, the trusty stereo amp is rarely stacked out with long feature lists and instead concentrates on one sole objective – to make your music, regardless of source, the best it can be. Premium hi-fi set-ups require a top stereo amplifier to pump the music through, and we've found four candidates that all believe they're the one for you. Technics, Rega, Roksan and Arcam – there's only room for one winner. But that's not all! Not so long ago, spending less than £100 on a video player would've left you with a choice between supermarket own brands and little else. Now, however, you have the choice of some top performers from major brands. Our First Tests include some Technics speakers, Sennheiser in-ears, a Pioneer speaker package, a Sony DAC and a Klipsch soundbar among this month's debutants – and, as we all know, making a good first impression counts. And what if your resolution in 2015 is to become more active? You'll want your music to help spur you along those cold winter runs, so we have a look at the budget sports headphones that are gunning for the gold medal. The regulars are back in force for 2015 too, with our Insider considering the next step in streaming as MQA and 4K get set to take the market to a whole new level. Is the era of high-res streaming about to dawn? We'll soon find out. McIntosh and Wilson Audio are behind this month's Temptations, while Playlist considers the movies, music and games to test your system this month. And taking us on a trip down memory lane is Sony's BDP-S1E Blu-ray player. That's some line-up for our February 2015 issue and we think you'll agree. Just pop on down to your local newsagent and pick up your very own copy today. Alternatively, buy online and grab yourself a digital copy.